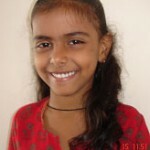 Mansi, daughter of a tailor, is another child nurtured by SAGE. She is beautiful and brilliant. Mansi is the poster child and face of SAGE Foundation and dreams of being an engineer. SAGE is indeed proud of her and wants the whole world to adopt children like Mansi.